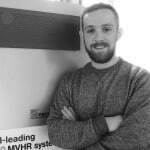 The best MVHR system is the one you don’t know is there. 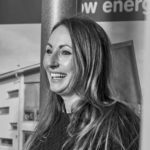 Green Building Store is nationally recognised for its expertise in designing, supplying and commissioning MVHR systems for Passivhaus and low energy projects. 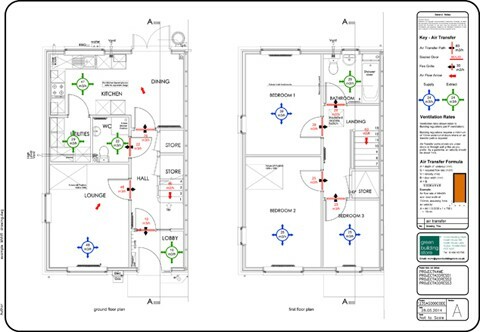 Our design service is qualitatively different to most other MVHR providers. 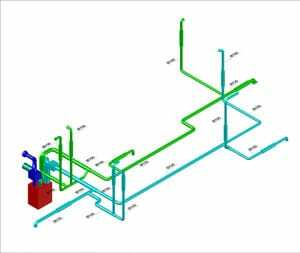 As well as designing a system to physically fit in a building, we model the system in 3D software to check performance of the system in terms of noise, pressure, balance and airflows. 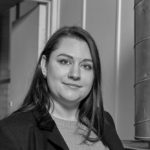 Green Building Store is far and away ahead of everyone else in terms of knowledge and expertise in designing and supplying MVHR systems for low energy and Passivhaus projects. We have been very happy with both the products & service from Green Building Store. I would have absolutely no hesitation in using them again. We have also had very positive feedback about the MVHR systems from our clients. In fact, the only complaints we have had are that people are worried that they’re not on, because the systems are so silent in operation! 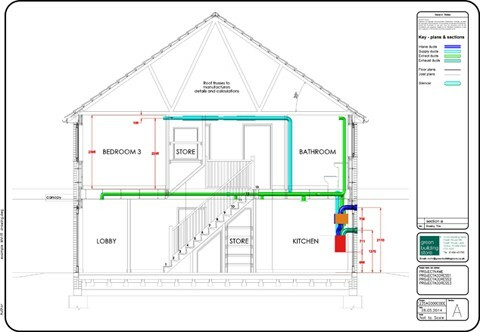 Green Building Store works with us to carefully design the HRV ducting system to ensure that the system performs at its optimum. It is very quiet, we can’t hear it at all. The MVHR system is also very easy to operate and maintain and the air quality is fantastic. The MVHR system is very quiet, in fact so quiet that sometimes I have been concerned that it’s not on. 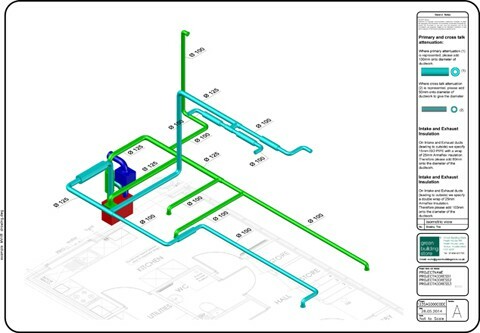 Through our detailed design process, we can ensure that we’ve designed the quietest, most efficient system possible for your building. Any potential problems are solved at the design stage, avoiding costly and inconvenient alterations later on. 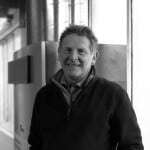 What makes our MVHR systems different? MVHR ductwork is embedded into the fabric of the building and would be very disruptive to have to replace, so it is worth investing in a high quality system from the outset. We recommend galvanised steel spiral wound rigid ducting for our systems, designed to last the lifetime of the building. We carefully calculate air flow rates of our systems to each room and look to select MVHR units that have constant volume flow fans. 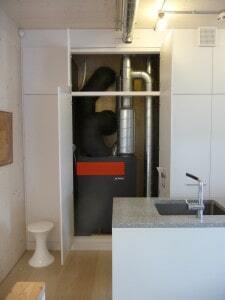 Ductwork airtightness is important to ensure that the designed air flow is delivered to the rooms. Air leakage is designed out through use of rigid steel round ducting systems with airtight joints. By minimising air leakage we reduce air speeds within the system, helping ensure lower energy consumption and noise levels. 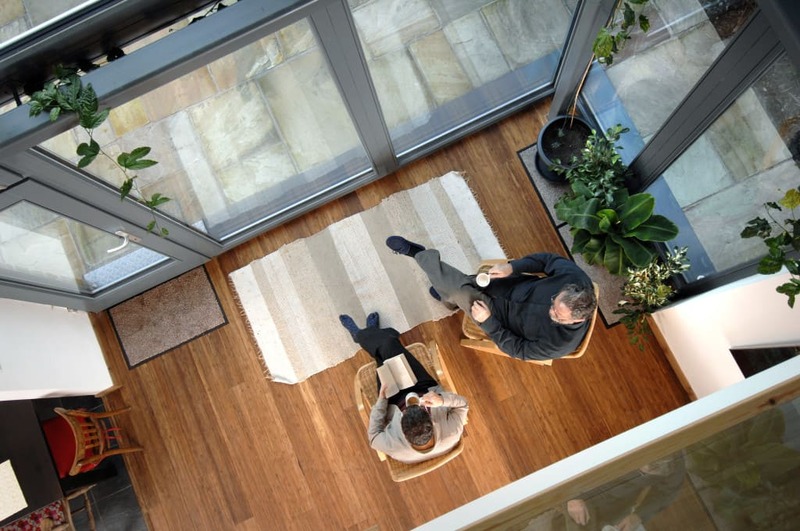 By designing the ducting to minimise air resistance and to suit the air flow requirements in each part of the building, our designs deliver the appropriate amount of fresh air to each room in the house while minimising the energy required to move the air. We offer a wide range of units from manufacturers including PAUL, Zehnder and Brink, to suit all projects and specifications. We help you choose a quality MVHR unit to suit the ventilation demands of the building and to achieve optimal heat recovery efficiency. Condensation within an MVHR system could cause damage to ductwork, the unit or the building fabric. We design out potential problems by paying attention to the ductwork detailing and insulation requirements where temperature and humidity differences will cause condensation, either inside or outside the duct. It is essential that MVHR systems run quietly, especially within already quieter well-insulated buildings. Unlike the majority of our competitors, we model the acoustics of our systems so that we choose the right size of sound silencer for each duct run. We specify primary attenuators (silencers) to reduce noise generated by the MVHR unit fans, and secondary ‘cross talk’ attenuators, to reduce voice transmission between rooms. The cross talk attenuators also offer further sound suppression for duct generated noise. 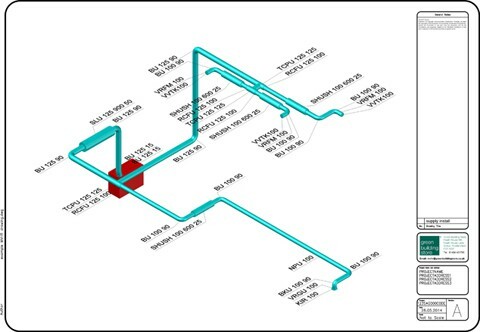 Duct sizes in our designs are typically larger than those specified by other companies, helping to keep air speeds low, thus minimising duct generated noise. 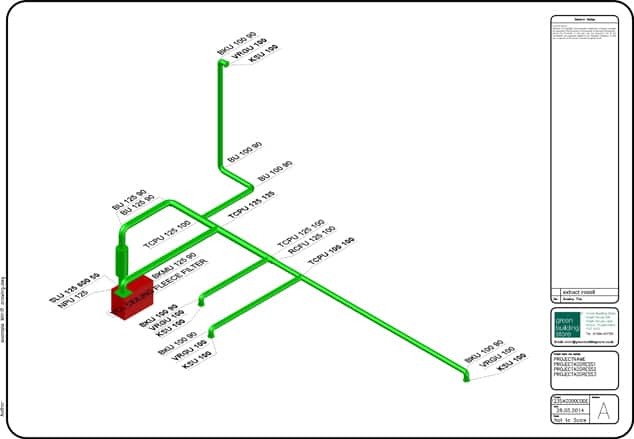 As a result, we design our MVHR systems to have noise levels of no more than 30 dB(A) at the extract valve and no more than 25 dB(A) at the supply valves. 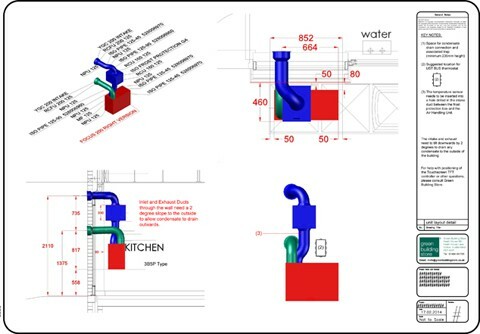 As well as offering an Approved Installer scheme, we can also offer telephone support for installers and supply clearly labelled ducting drawings to facilitate step by step installation. It is critical that the system is correctly commissioned in order to maximise comfort and energy efficiency. Green Building Store’s optional commissioning service also offers a valuable check on the installation process and functioning of the MVHR system. 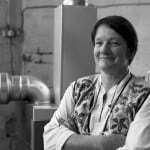 Green Building Store has a national reputation for designing high quality MVHR systems for Passivhaus and low energy builds, from one-off houses to large social housing schemes and community centres. 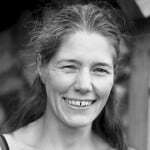 View testimonials and case studies. 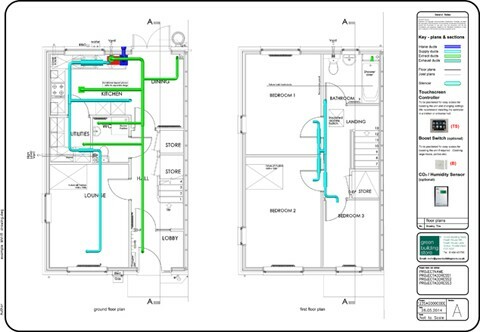 Examples of the typical MVHR system drawings & designs that we offer our clients.